The leafs are about 3.5 feet across and unfortunately due to the grain, they bow differently than the table. 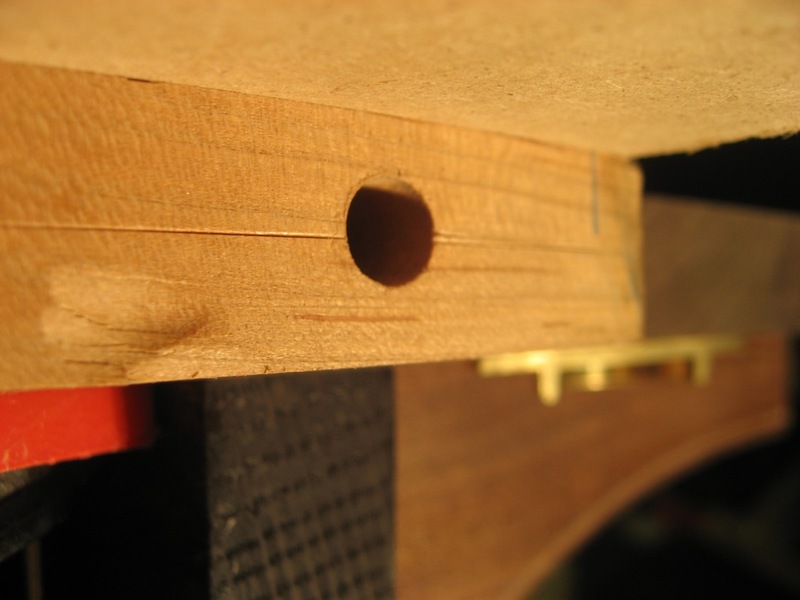 Therefore alignment pins are necessary to help keep things flat across the joint. 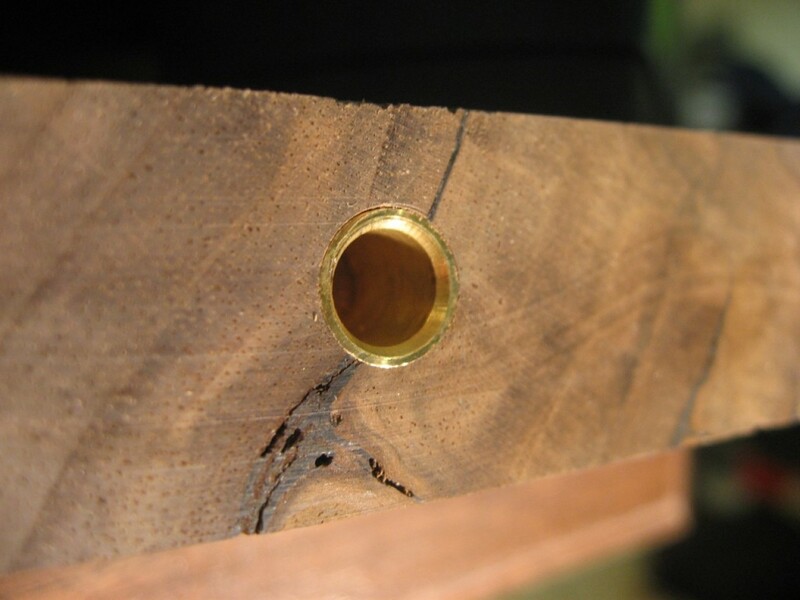 I made a quick jig to align the pin holes (in the leaf) to the sleeve holes (in the table). I drilled through a piece of square stock to create a guide for the drill bit. Then I attached a flat piece of MDF that is clamped to the table surface. This keeps a constant distance from the top of the table to the pin/sleeve hole. Here is the jig clamped to the table and a Festool drill to make the holes. I align the jig”s edge to a pencil line struck across the joint (one per pin/sleeve). Tools for the alignment pins: drill, jig and clamp. The drill bit is guided through a hole in the jig. This does get reamed out with use, but I was careful and got about 15 holes drilled before I felt it was too loose to continue to be accurate. At that point, I just made another jig. I made sure to use the same jig for each set of holes! And a sleeve inserted into the table. There are about 9 pins along the 3.5″ joint which really help to keep the top flat across the joint. I’d be very surprised if a pin every 5 or 6 inches will really stop the table and leaves from moving independently of one another, or being able to pull them back into alignment. But good luck with it! Jim — yeah, the table and leaves are already moving in slightly opposite directions. However, the pins do pull them back into a common plane. It may not be overall “flat”, but it’s smooth across the joint. Of course, time will tell if the wood wants to move enough that the pins eventually fail. 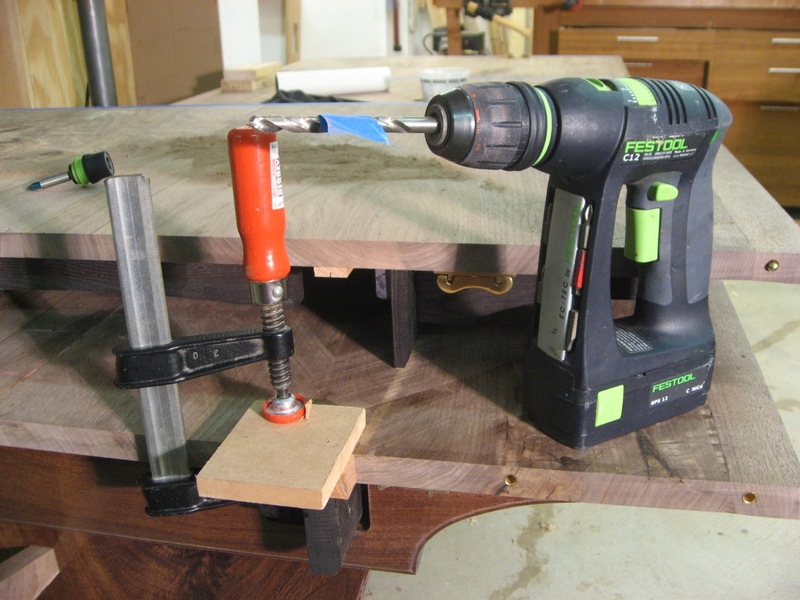 Woodworking Magazine Articles: The Same Story All Over Again? The Lie-Nielsen Hand Tool Event: More Pictures!